Live mobile video isn't new, but many of today's most popular social media companies are investing heavily in the technology, and they're pushing more live broadcasts to their users' feeds. The development has significant potential implications for digital marketers and the enterprise. Mobile live video is ready for the masses, and it's coming soon to a smartphone near you. Social media market leaders Facebook, Snapchat and Twitter are battling for users who create and share live mobile broadcasts. The concept of live video on mobile devices isn't new, but today it tops many social companies' priorities. Facebook CEO Mark Zuckerberg seems determined to capitalize on the opportunity, for example. Twitter CEO Jack Dorsey recently used the word "live" four times in a single sentence when describing Twitter, and Snapchat wouldn't be as popular as it is today if not for its early bets on live streaming. Facebook, the newest player in the live video game, began testing Facebook Live in December, and it quickly expanded the feature's availability during the past few months. Snapchat added a live video feature to its app about 18 months ago, and Twitter's live-video service Periscope will celebrate its one-year anniversary later this month. Social media companies are leading the charge for live video, because they have the large amounts of users and the infrastructure to ensure those users know when parties of interest broadcast live, according to Andy Levey, director of marketing and content for Cirque du Soleil. Levey says the live video market is quickly becoming an "arms race" between Facebook and Snapchat. "Social networks are all about connecting and bringing you closer," he says. "It started out as text, then static imagery, then video, and now live videos and 360 videos. The closer you can be to experiencing something firsthand, the better." To see Snapchat's "Live Stories," users still need to swipe at least two times from their message feeds, but Facebook and Twitter are bringing live video to the forefront. 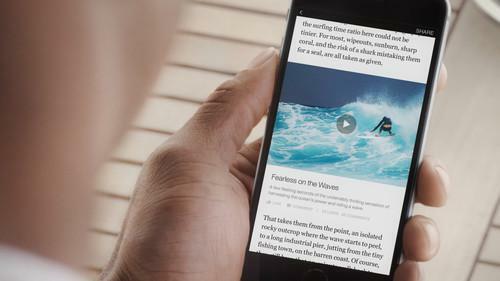 For example, Facebook now considers live video a new content type, and it presents live videos higher up in users' news feeds as they're broadcast. And Facebook says people spend triple the amount of time watching a live video on average than video that is not live. Twitter also started to embed Periscope broadcasts in tweets and users' timelines in January. Though Facebook's massive audience seems to have embraced live video, and Snapchat shines as a storytelling platform, no single service has run away with the market; there is still plenty of room for new entrants and shifts in competition, according to Levey. "[I]t's the wild, wild west out there, which is both awesome and frightening." Live video breathes new life into the creative efforts of brands that want to create more immersive experiences, according to Elizabeth Closmore, vice president of strategy and partnerships at Sprinklr, a social media management platform for enterprises. "Live video humanizes everything. It's more one-to-one than a recorded video, it's personal and it allows the consumers to feel like they are participating in a shared experience," she says. Platforms with strong social components will likely be the most successful, because "live video is only a commodity if it's shared." Both Closmore and Levey expect the sophistication of live video, and its potential audience, to increase during the next year. "While it isn't entirely polished, we're at a point where there's an appetite for the raw video," Levey says. He also expects live broadcasts on Periscope, Facebook and Snapchat to soon rival the quality of videos on YouTube and reality network programming. "There will be a raising of the bar, and it will get to the point where both personalities and brands have polished live videos … The behavioral pattern of viewing is going to change." Virtual reality (VR) will also likely play an important role in the future of live video, and some of the leading players in the live video market, such as Facebook, are also investing heavily in VR. "Live video feeds the consumer need for real-time engagement, and VR will take this to the next level, allowing for interactivity and true suspension of disbelief," says Beck Besecker, CEO at Marxent, a VR app developer. Without VR as a component, mobile live streaming will be more like cable news, he says. "It may be live, but it's not immersive." For now, the battle lines appear to be drawn among a few leading social platforms, but many more companies are likely to try their hands at live video. Dedicated live video sites, including YouTube Live and Ustream, are also capable of hosting and building engaged audiences, according to Closmore. "At the end of the day, it comes down to infrastructure to support the streaming, discoverability to surface the content and a social contract with the end users so they stay interested enough to come back and use the platform." For enterprises, the promise of live video extends beyond marketing, according to Closmore, and the medium holds clear potential for customer service, reviews, product demonstrations, investor meetings, and research and development. "Much like social has done in the last five to 10 years, live video has the potential to bring brands even closer to their audiences and customers," she says. "There's nothing more transparent or real than a live broadcast where anything can happen."